Families can be big, small, happy, sad, rich, poor, loud, cross, worried or happy-go-lucky and this book gives you a joyous glimpse at them all. Look at how other families celebrate birthdays or how they work, the homes they live in and the pets they keep. Families come in all sorts of shapes and sizes and this wonderful book celebrates them all. 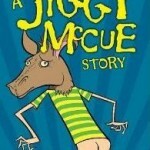 It’s great to see Jiggy McCue back in another hilarious (mis) adventure. Strange things always seem to happen to Jiggy – and this story is no different. Jiggy’s new Drama teacher takes an instant dislike to him and makes him play Bottom in the school play, A Midsummer Nights Dream. Needless to say, nothing goes as planned, least of all for Jiggy.